You can show titles, captions, and tooltips on any sheet. After you add a title or caption you can edit and format the text as well as modify the shading and border. If a title or caption is not showing, from the top menu, go to the menu for the current sheet type (Worksheet, Dashboard, or Story) and select Show Title or Show Caption. A legend card appears in the worksheet when you encode marks by dropping them on the Color or Size cards. You can format the legend font, shading, border, and alignment. You can also edit the titles that appear on each legend. If you are editing a worksheet title on Tableau Server or Tableau Online web editing, double click the item you want to change. Worksheet captions and legend titles cannot be edited in web editing. Right-click (control-click on Mac) the item you want to change and select Edit <item>, for example, Edit Title. On a worksheet, hover on the title, click the drop-down arrow on the right-hand side and select Edit Title or Edit Caption from the context menu. 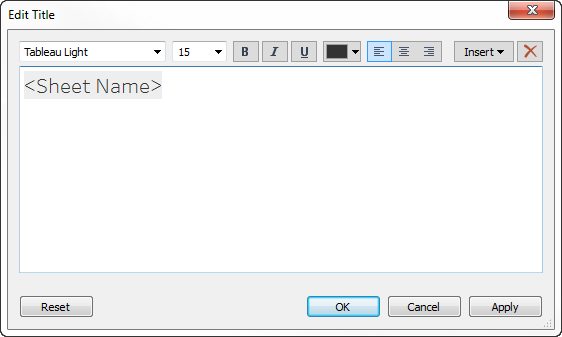 In the Edit dialog box, modify the text and format the font, size, style, color, and alignment. Use the Insert menu to add dynamic text such as sheet properties and field values. Click OK.
To reset the title back to the default, click Reset. Right-click (control-click on Mac) the title, caption, or legend and select Format <item>—for example, Format Title. In the Format pane, use the drop-down lists to change the default shading and border. In a dashboard, double-click the title. In the Edit Title dialog box that appears, format the title as you like. You can enter a new title for the dashboard or a description, as well as change the font type, size, emphasis, color, and alignment. You can also type in a website URL and Tableau will automatically create a hyperlink. Note: If you edit the hyperlink, make sure to delete the entire hyperlink and then reenter the new one. If you do not do this, the text of the hyperlink will update, but the URL path will not. The dashboard title updates with the changes. Tooltips are details that appear when you rest the pointer over one or more marks in the view. Tooltips also offer convenient tools to quickly filter or remove a selection, select marks that have the same value or view underlying data. 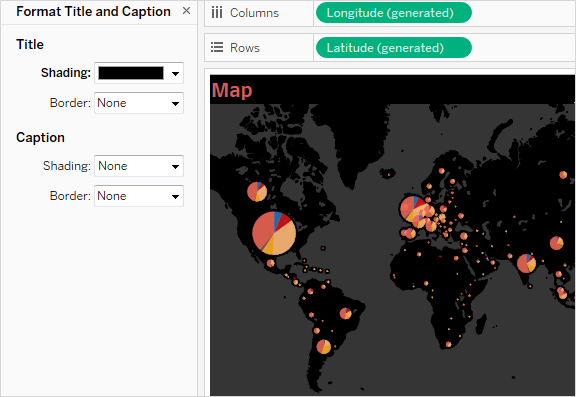 Watch a video: To see related concepts demonstrated in Tableau, watch Basic Tooltips, a 7-minute free training video. Use your tableau.com account to sign in. You can edit the tooltip to include both static and dynamic text. You can also modify which fields are included in the automatic tooltip. Select Worksheet > Tooltip. Tooltips are specified for each sheet and can be formatted using the formatting tools along the top of the Edit Tooltip dialog box. Use the Insert menu at the top of the dialog box to add dynamic text such as field values, sheet properties, and more. Use the formatting tools along the top of the Edit Tooltip dialog box. (Optional) Use the Insert drop-down list at the top of the dialog box to add dynamic text such as field values, sheet properties, and more. The All Fields option on the Insert menu adds all field names and values that are used in the view. Inserting the All Fields parameter updates the tooltip as you change the view. You can also use the All Fields option to exclude fields. (Optional) Select the Include command buttons option to show filtering and view data options in the tooltip. 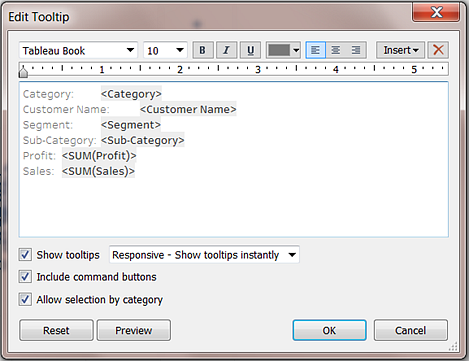 For example, including command buttons will add Keep Only, Exclude, and View Data buttons to the bottom of the tooltip. These command buttons are available both in Tableau Desktop and when the view is published to the web or viewed on a mobile device. (Optional) Select the Allow selection by category check box to select marks in a view that have the same value by clicking on a discrete field in a tooltip. For more information see Tooltips.